While at my sister's this weekend, I played what I think is the most bizarre video arcade game ever. 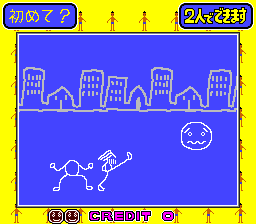 It's called Ganbare Ginkun and it is a Japanese arcade game from 1995. Here's a link to some screenshots from it. It's a game where two players compete in various "mini-games" - fairly simple games that last about 30 seconds or so. The whole thing is in Japanese, so part of the fun was trying to deduce from kanji and acompanying diagrams what the instructions were for each minigame. There were at least a dozen or so different mini-games and they involved such tasks as trying to land your head back on your body after it was shot up into the sky, trying to be the first to fire a cannon at your opponent when the referee yells "Go!" but not when he yells other things like "Cool!" or "Boom! ", trying to eat the correct sushi as various plates whiz by on a conveyer belt, and most bizarre of all, trying to put out a fire by peeing on it. Yes, you read that right - by peeing on the fire. The game uses a very simple "hand-drawn" line art for the graphics, so all the people are stick figures, adding to the silliness. Here's a screenshot showing the end of a game in which the player did not land their head properly back on their body. As a result, some shaggy haired person ran out onto the field of play and kicked the players head away as a punishment! It's total silliness! My mom's side of the family had a bit of a reunion up in Wolfeboro, New Hampshire this weekend. In all, about 35 relatives got together at my sister's family vacation house. One of my cousins remarked that it was interesting to note that all the family members present were there as a result of just two woman (my mom and her sister). It's an interesting observation on population growth, I suppose. 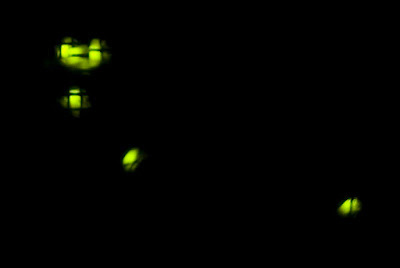 Late Friday night, while I was trying to fall asleep, I noticed a blinking yellow-green light outside the window. It turned out to be a firefly that had landed on the screen and was climbing around and blinking. I tried to take a picture of it in the dark, but this was the best I could do. 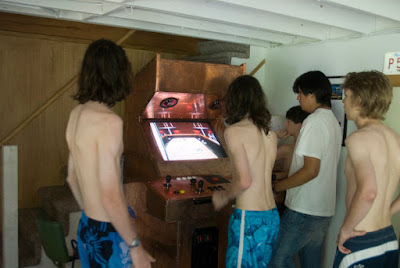 It was nice to see the arcade machine I had built had made it to NH safely and was getting lots of use. Given the partly rainy weather, the machine probably got more use this weekend than it had the past few years it had been at my condo. 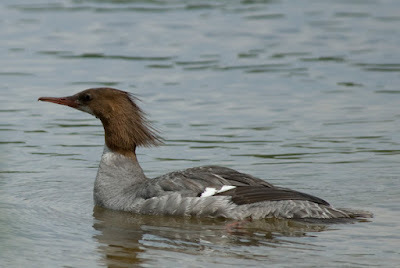 There was some interesting wildlife in the area. 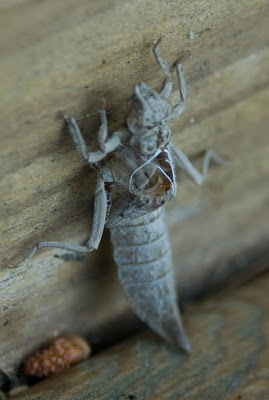 First off, I noticed these two empty husks of some insect. I have no idea what it was, but it looked interesting to me. 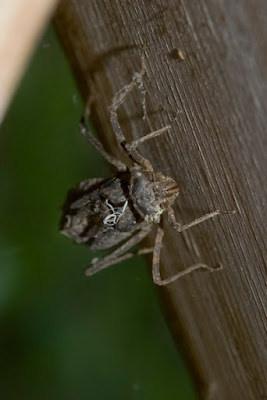 Notice how both empty shells have the same curly white threads where the insect ripped out. Odd. 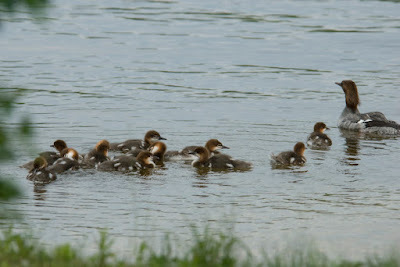 At one point in the day, a family of mergansers swam by on the lake. 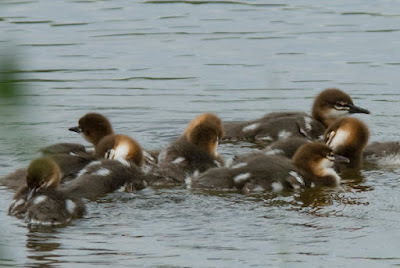 There were about 12 babies! Later that same day, I heard a sound in the nearby woods that kind of sounded like a monkey -you know, something like "oo-ooo-aaaa-aawwww!". 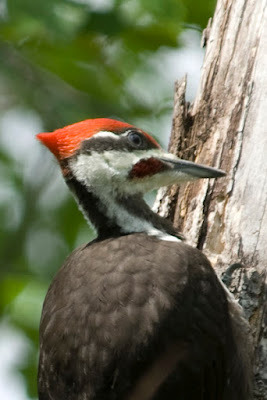 My sister said it was a pileated woodpecker. Sure enough - she was correct. Someone quickly spotted it in a tree. 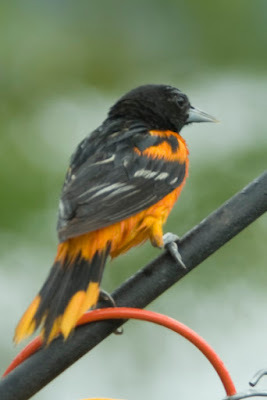 Out of the twenty or so shots I took, I was able to get a few decent pictures before it flew off. This was the first time I had ever seen a pileated woodpecker (other than watching the Woody Woodpecker cartoon when I was a kid). They're pretty impressive looking! 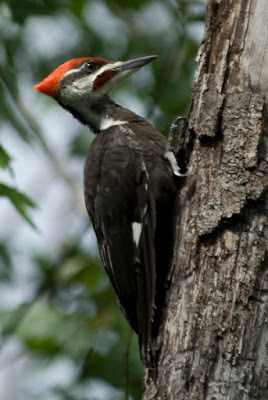 I thought this entry on the USGS web site (under the category of similar species) was kind of funny: "No other living woodpecker could be confused with the Pileated." 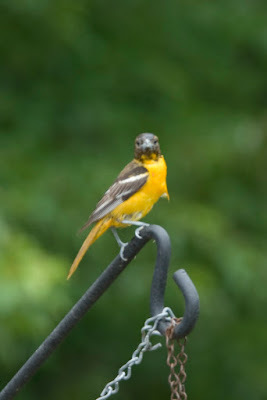 My sister has many bird feeders on her property. 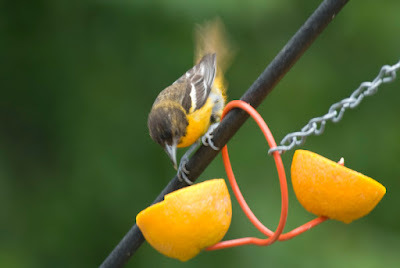 She also leaves out a few sliced oranges on spikes. 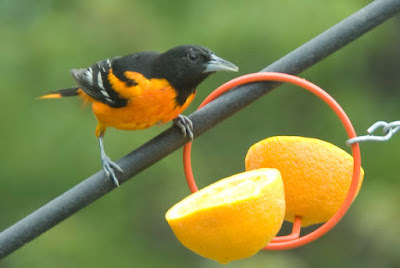 It turns out they are good for attracting Orioles. Both an adult and an immature one stopped by while I was watching. Unfortunately, it was dead, but it's still quite beautiful and the wings were hardly damaged. I found the spots on the wings very interesting - parts of them are transparent. It's quite large, too. It's wing span is about 6 inches! 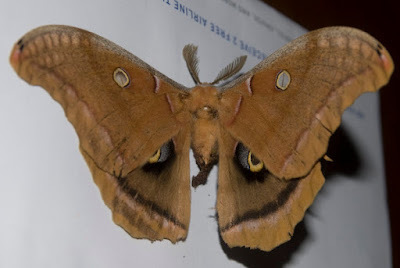 I think it's a polyphemus moth (see here). I've never seen one before. Unfortunately there are plenty more dogs like him in shelters. 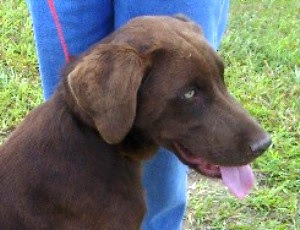 Give Petfinder a visit some time if you are looking for saving a dog or cat from an uncertain future. But, back to my other point - I discovered he (the dog, not the friend) also seems to enjoy a game of hide and seek. My friend was a bit skeptical when I suggested the idea, but the dog was quick to get the idea of the game. 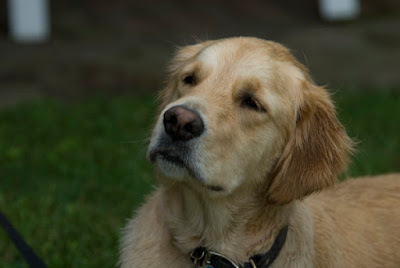 So, if you have a dog and you are getting bored with the throw a ball and wait for it to be brought back, give a game of hide and seek a try.